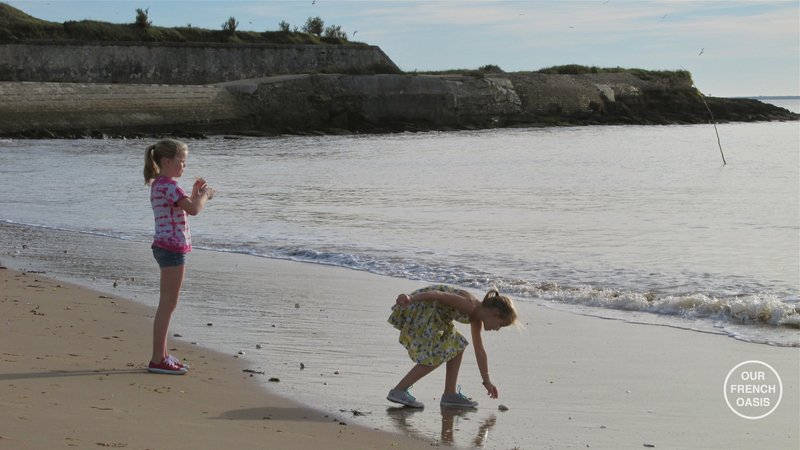 We are nearing the end of the children’s 2-week autumn holiday, although to be honest it feels more like summer. 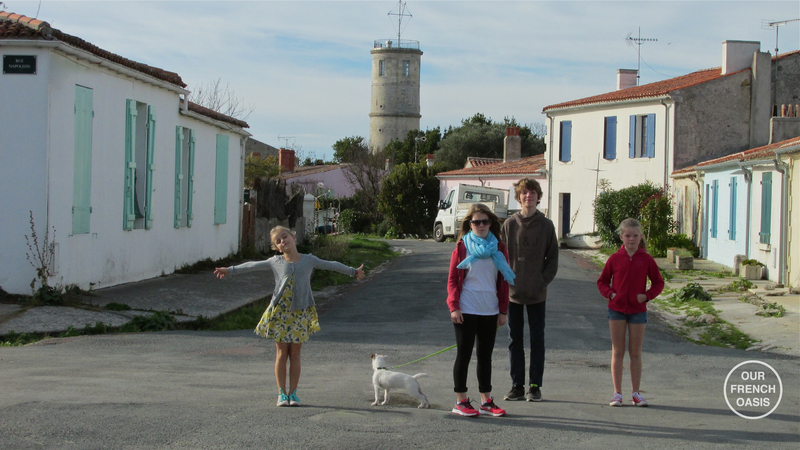 Gigi and I were up early and driving over the bridge to the Île d’Oléron (a bridge that is nearly 3kms long, I might add) for her tennis lesson whilst the rest of her siblings were still lounging about in their pyjamas at home. But by the time we returned a couple of hours later it was a very different scene; everyone was ready and waiting, organised as any large family can be, for the expedition we had planned the night before. 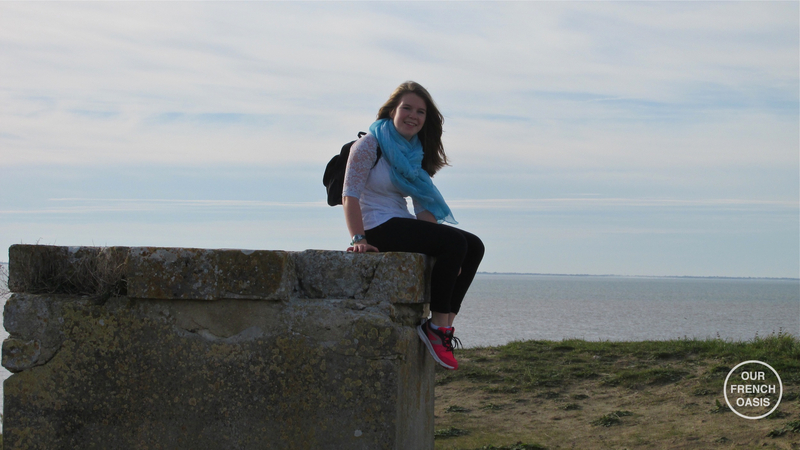 We were headed to another island, the Île d’Aix. Only this island doesn’t have a bridge, but a ferry, AND it’s a ferry that doesn’t run very often at this time of year, so we couldn’t be late; if we were the trip would simply be abandoned, and with that threat hanging over them there was nothing better to get children out of the door in a timely fashion. Confusion reigned at the ferry-terminal as the ticket-office was closed. A handful of us stood by the little sad building looking somewhat lost as the ferry drew up alongside the quay, but when we saw the other hundred or so people on the quay start to surge towards the boat, we followed, edging forward like sheep, blindly following the person in front; and once we got close to the gang-plank it became apparent that we were to pay as we boarded. This, however, was a slow affair, and after another fifteen minutes the captain on the bridge signaled for the crew to allow everyone on board and we cast off and departed, those who had not paid doing so once we were underway at a little kiosk on the open deck! 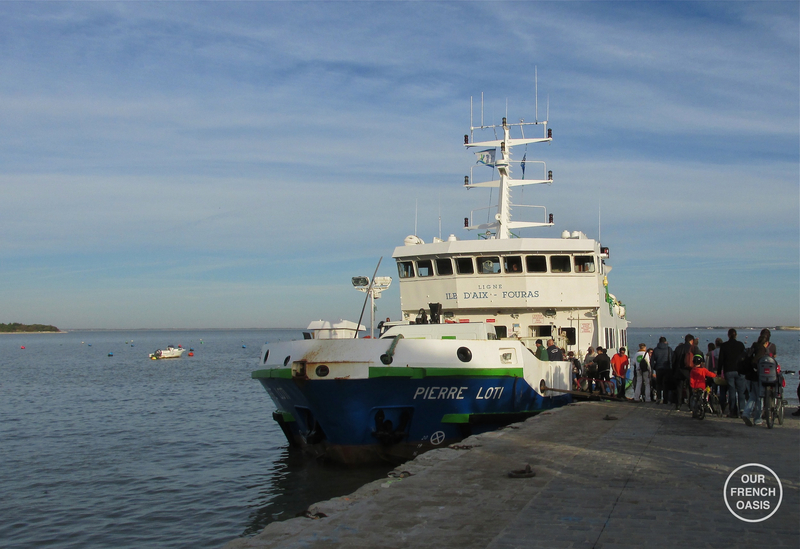 It’s only a 20 minute crossing to the Île d’Aix. None of us had ever been to the island before and we really didn’t know what to expect. 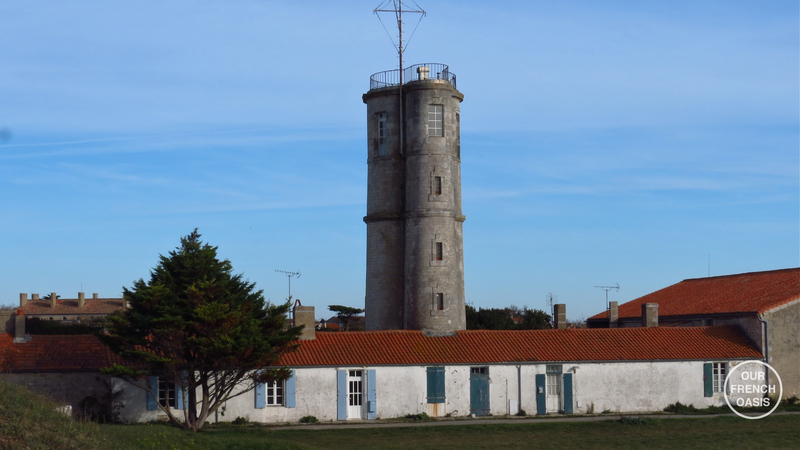 I was envisioning a ‘chic’ smaller version of the Île de Ré, while Roddy thought it would be more like the Île Madame, virtually unoccupied and remote. 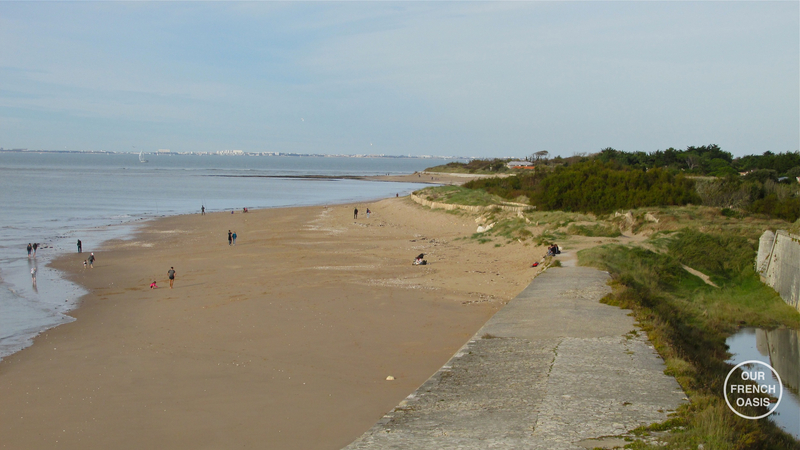 However, as we were to see, the Île d’Aix is different again, with its small landmass the setting for some heavy fortifications by Vauban, the renowned 18th century French military engineer, which were then subsequently improved again by Napoléon in order to protect the naval base at Rochefort on the coast of the mainland. 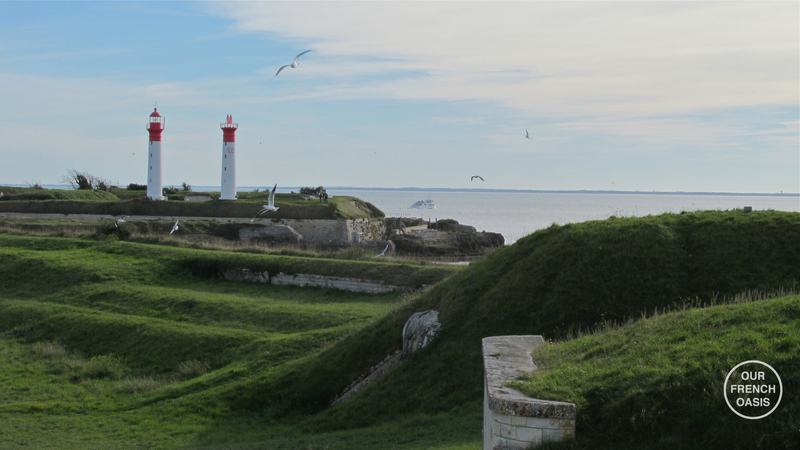 Fort Liédot was also used as a prison during the French Revolution, then later again during both the Crimean and First World Wars. The island also has some German fortifications from WWII, something we all felt familiarity with due to our Channel Island connections. On arrival, one leaves the ferry and climbs a sloping jetty; you then pass through a fortified gateway and cross a drawbridge and enter the interior of a vast green space where immediately everything steps down a gear from everyday mainland life. A little to the north, a 100 yards away, is the tiny village that is the capital of the island. 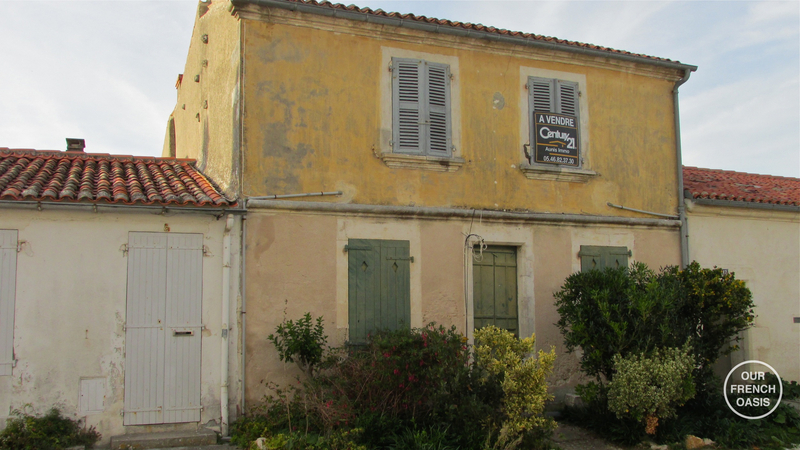 It really is very very small; there’s a cycle-hire shop, a little tabac selling one or two souvenirs and some postcards and magazines, and then there’s a boulangerie – that’s it on the shopping front! 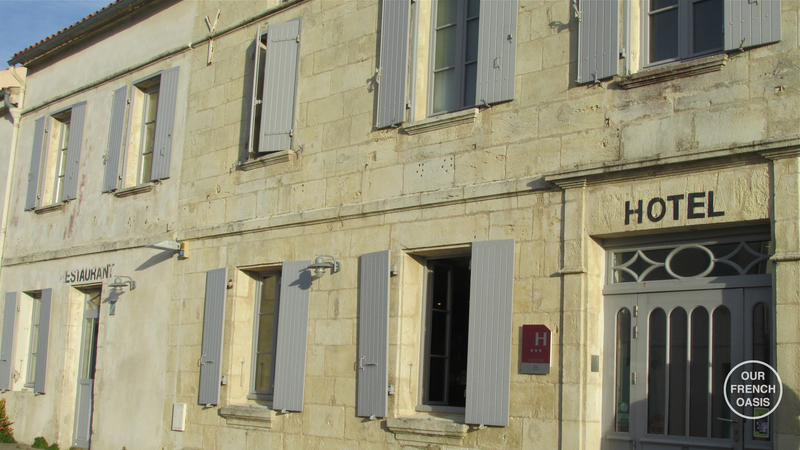 In addition, there are a couple of small unpretentious restaurants and the island’s only hotel, unsurprisingly called the Hotel Napoléon! 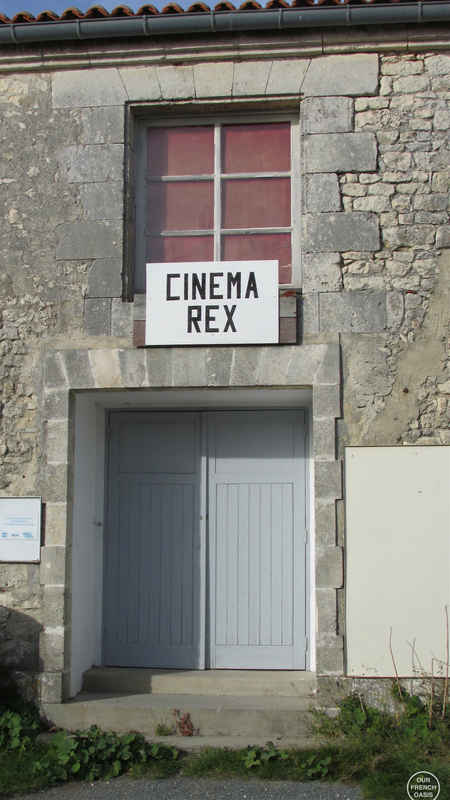 Oh, and there’s a cinema in an old barn! 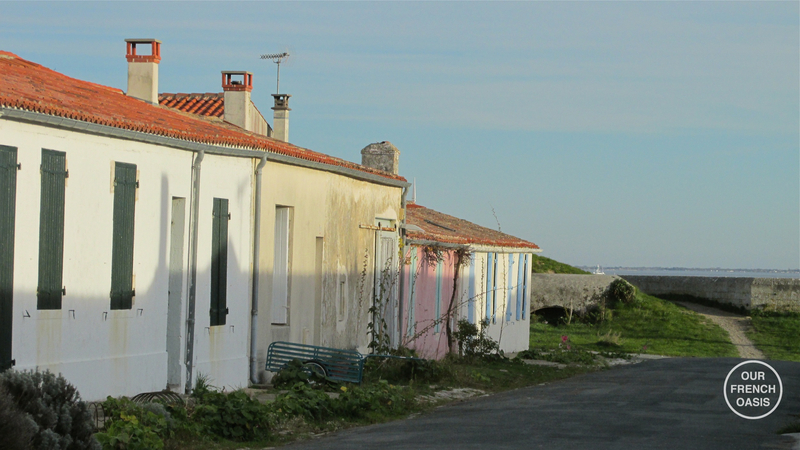 All of this is within a cluster of houses where most of the Islands 200 permanent residents live, many of them in original long low fishermens cottages. As we walked the little streets, we realised that we’d already seen many locals on the ferry as they passed us pulling hand-carts full of provisions to see them through another week. The island is virtually car-free apart from service vehicles, and it’s either pedal-power or foot-power to get around for tourists and sight-seers. 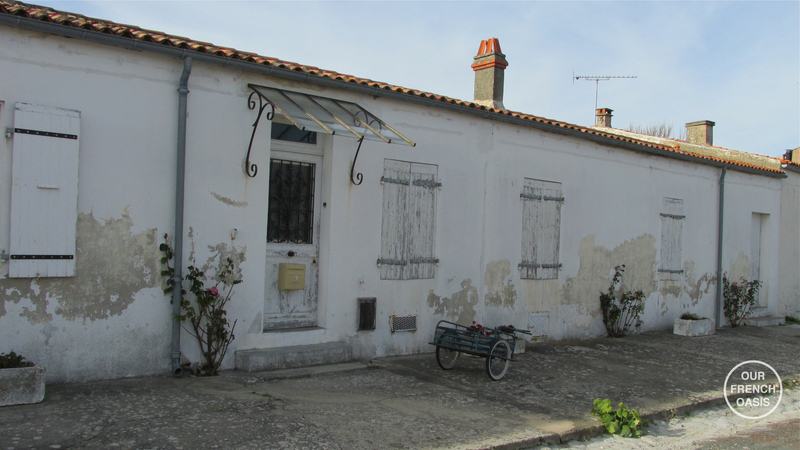 After some debate, for it was not a unanimous choice, we decided to opt for the latter mode of transport and set off down a small narrow lane past an impossibly pretty little row of houses. We really had no idea where we were going. 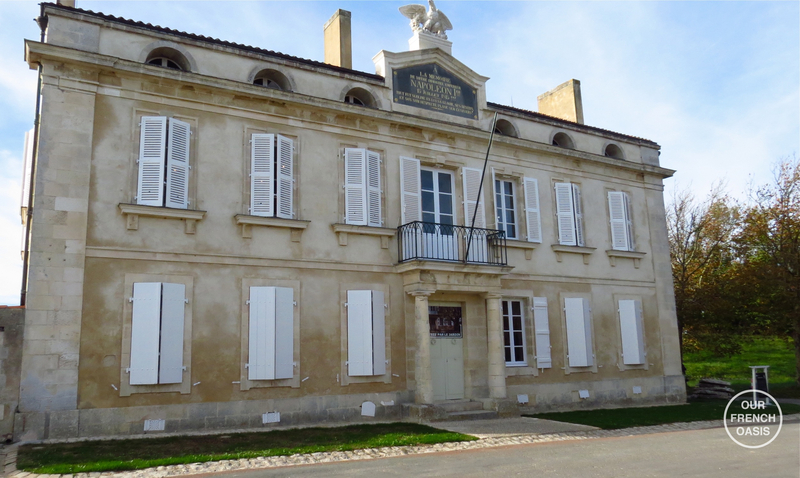 The island is only 3kms long so we knew we would not get lost and by chance we ended up outside Napoléon’s old home, now a museum. 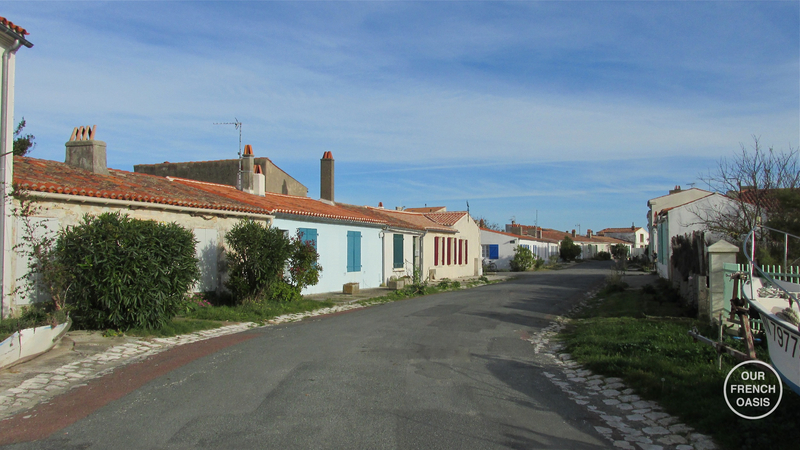 The island is well known in the area as the place where Napoléon spent his last days in France from the 12 – 15 July 1815, planning an escape to America. Realizing the impossibility of accomplishing this plan, he wrote a letter to the British Regent and finally surrendered, after which he was exiled to Saint Helena. With the sun high in a clear blue sky we opted to skip visiting the museum, much to Roddy’s chagrin, but we had Evie with us and I wasn’t sure she would be allowed inside; it was an excuse I played on heavily as we really wanted to be exploring outside! 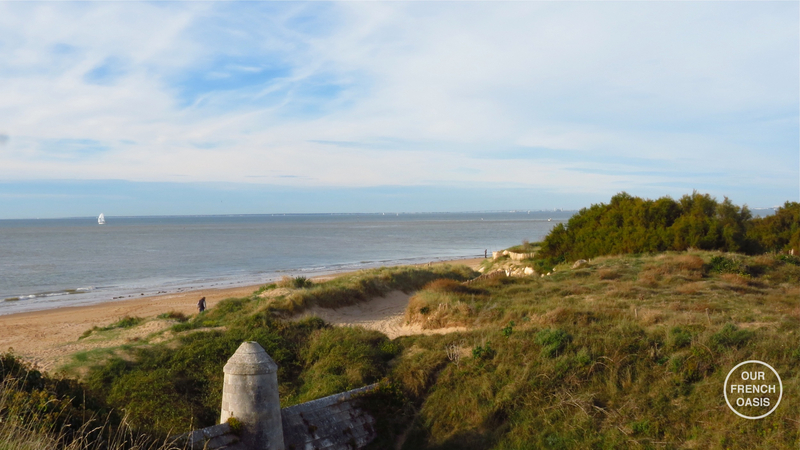 We walked on westwards towards the twin lighthouses and the old fortifications, the children running on ahead, climbing the WWII bunkers and playing amongst the spooky old Napoleonic ruins. From here the view was simply breathtaking; out beyond us was the Île d’Oléron, where Gigi and I had been just a couple of hours earlier, and to the north we could see La Rochelle and the bridge spanning the water over to the Île de Ré. To the east lay the tiny Île Madame. 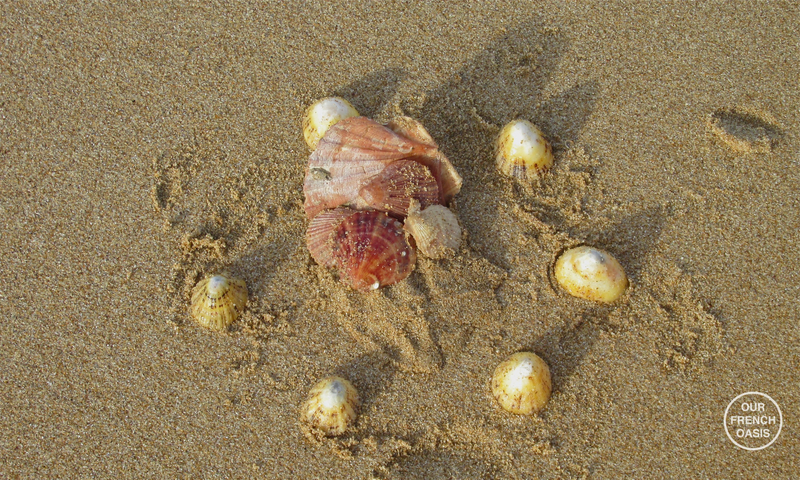 Following a well-trodden but quite deserted grass-path we stumbled upon a most beautiful beach. A handful of people were making the most of the Indian summer, jeans rolled up, socks and shoes left well out of the waters reach, and a couple of toddlers were splashing in the shallows, quite oblivious to the cold water. We collected shells and Roddy stood and chatted to a local fisherman who had three rods out in the small surf, hoping for a bass or a maigre. As we turned to look at Evie who had spied another dog we momentarily forgot about the sea and Millie and Hetty were suddenly left standing with very wet feet and soaking shoes! Laughing at their misfortune we continued down the beach before taking a small track inland. 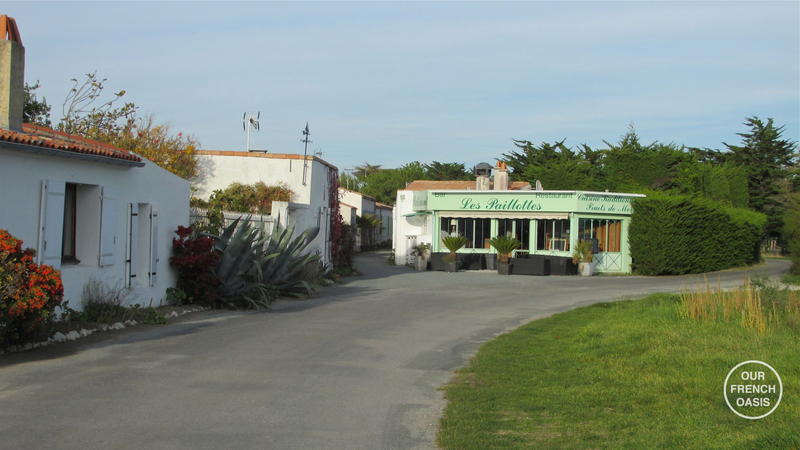 There were a couple more small restaurants, here on the eastern side of the central part of the island; they were all closed now that the main season was over, but as we were parched with thirst we headed back into the little village in search of some water and some afternoon goûter. Jack and the girls wanted ice-cream – of course they wanted ice cream, it was a day out and on days out they always want ice-cream! The boulangerie was closed though, and the tabac/souvenir shop sold no form of liquid or any other type of refreshment. There was nothing to be had at all, the tourist season was over and no one was selling ice-cream to crazy English children at the end of October; never mind that the weather was more reminiscent of summer! Stopping to take photos I spotted this house for sale, I wondered what it would be like inside, and what sort of price tag would be attached to it. We thought it would either be a vastly inflated price on such a small island, or perhaps very cheap as it’s a place where few people live and there is no commerce! I’ve since phoned the agent as my curiosity got the better of me; alas, it’s pretty much a bare shell inside and probably twice the price it should be! As the sun had dipped low in the sky we made a mad dash back for the ferry as we decided to take the earlier sailing before darkness fell and we all froze. Stopping on the jetty to pat his pockets, Roddy announced that he could’t find the return tickets, which made us all anxious for a while but it didn’t matter anyway, as no one checked for them on board – it’s just not that sort of place. Of course, thinking about it later, he probably didn’t even get given any actual return tickets in the first place, because you simply have to return at some stage! We all huddled together on the open deck of the ferry; the Indian summer afternoon had given way to a chilly evening with a stiff breeze, and the girls shared the only available bench wrapped in Roddy’s jacket, Evie curled up asleep buried on Gigi’s lap – warm and snug. We ticked off another island, another fabulous day, and another place we’d discovered on our doorstep. 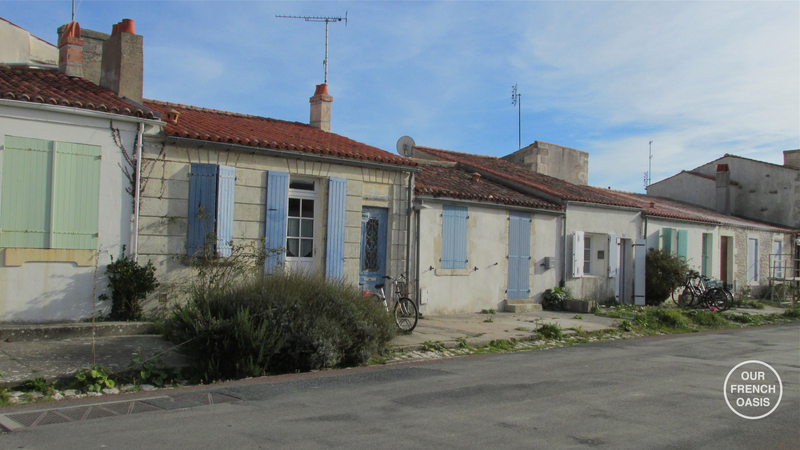 Undoubtedly the real appeal of the Île d’Aix though is the chance to get back to nature; it’s not glamorous, there’s no bling, and in fact it seems almost slightly run down, but it certainly has a haunting quality that it quite unforgettable. We all agreed that the next time we’d go back with our bikes and a picnic! What a beautiful place and memory to make together. I like traveling around these kind of places not during the touristy season, and it looks like you guys had the island all to yourselves! You’ve got lucky kids to have parents who care so much about taking them to cool places! Great post! What a lovely place to visit! 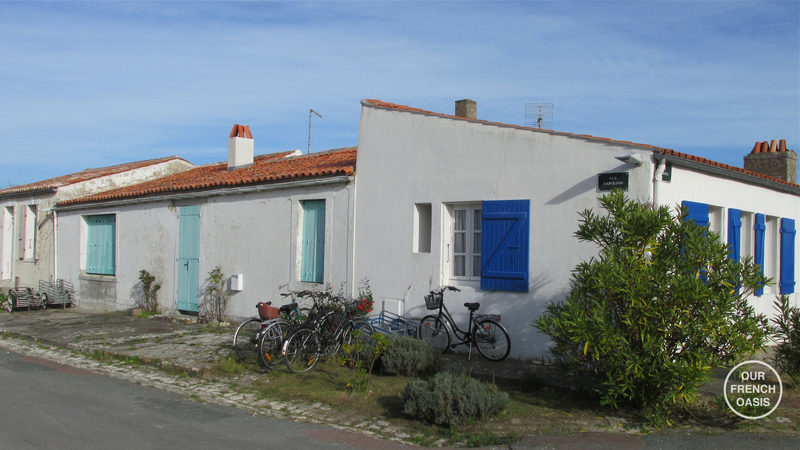 I have been on Île de Ré but not on a smaller one. Next time I’m on the Atlantic coast, I will have to take a boat trip. do they fieel like Alderney, Herm etc. or are they completely different (one or other of them) ? 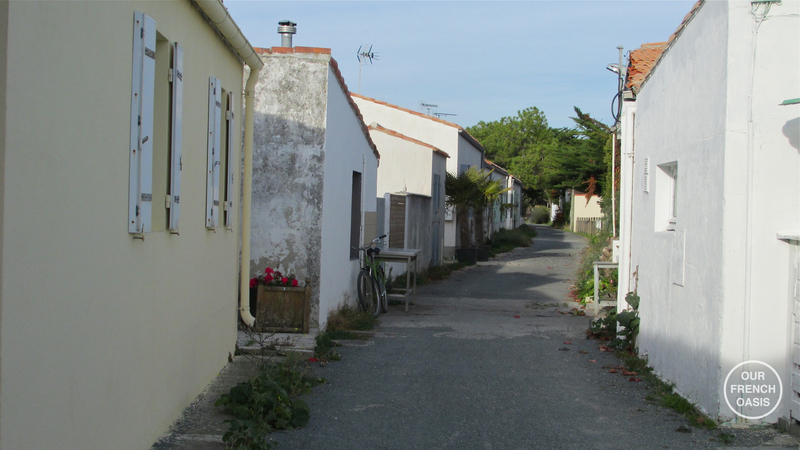 They do a little, yes, the Ile d’Aix reminds me of Sark, car free but still inhabited. There are quite a few similarities.